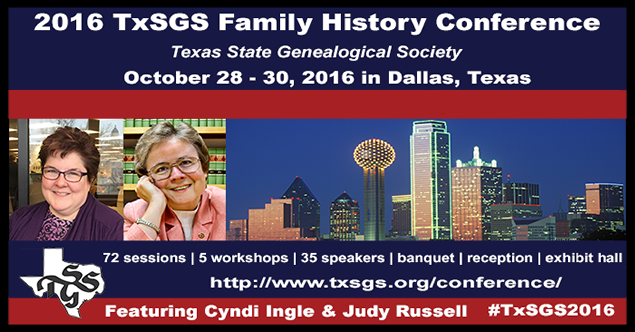 The Legal Genealogist is in the Lone Star State today, getting ready for tomorrow’s kick-off to the 2016 Texas State Genealogical Society conference in Dallas. Tomorrow — Friday — features morning breakout sessions, afternoon workshops and breakout sessions, and a Texas State Genealogical Society reception in the evening. Saturday has morning general sessions, afternoon workshops and breakout sessions, and the Texas State Genealogical Society banquet in the evening, featuring John Sellars on The Most Interesting Mann!, or My Treasure Seeker! Sunday there will be morning general sessions, an afternoon workjshop and afternoon breakout sessions. The whole shebang doesn’t wind down until 4:30 that afteroon. There will be workshops galore: Cyndi Ingle on Crafting Successful Searches (both Friday and Saturday), Kelvin Meyers on With or Without Land: Using Land Records to Find Your Texas Ancestor (Sunday), and some Legal Genealogist type on No Vitals? No Problem!–Building a Family through Circumstantial Evidence (Friday) and Order in the Court: Hands On with Court Records (Saturday). In other words… you really want to be here. And you still can: registration opens today at 4 p.m. at the Crowne Plaza Hotel in Dallas, where all the sessions will be held, and you can still register as a walk-in for the whole conference — or even for just one day. And, of course, throughout the conference, I’m going to be focusing on the laws of Texas. And oh brother does Texas ever have law. It’s got pre-republic laws of old Mexico. It’s got laws from the Republic of Texas. It’s got early statehood laws and late statehood laws. It’d be enough to send even this law geek running for the exits. Except for a man named Karl Hans Peter Mareus Neilsen Gammel. And all of those volumes of Gammel’s Laws of Texas are readily available online. Volumes 1-10 cover the years 1822 to 1897;4 those were the volumes published in 1898 with the documents salvaged from the Capitol fire. Volume 11 picks up with the laws of 1897-1902;5 volume 12 has the laws of 1903-1905;6 volume 13 the laws of 19077 and so forth. It isn’t often that all of a jurisdiction’s early laws are available with a one-stop-shopping site. But it’s sure true in Texas, thank heavens! And thanks to Karl Hans Peter Mareus Neilsen Gammel. So much love for TPTH — I’ve even had the pleasure of working with them on a digitization project, and the folks behind the scenes are awesome. Have fun at the conference! If only Gammel’s print volumes would not decimate my budget for the next few years. Oh, for the luxury of handling a paper volume! Please do a blog what an “equity court” did and did not cover. I know it probably has variations from state to state but a general guide would be nice!